This Legends N.L. 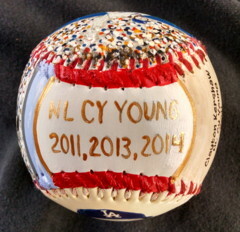 Cy Young Baseball features my original paintings. 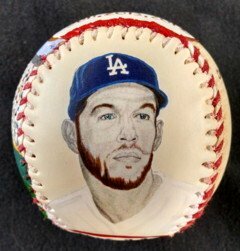 Side one has my close up painting of Cy Young Award winner Clayton Kershaw who won the N.L. Cy Young Award in 2011, 2013 and 2014. Click here for a closer look. 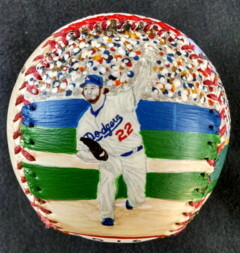 Side two has my painting of Kershaw's delivery. Click here for a closer look. 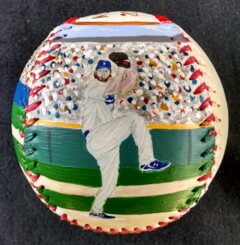 Side three has my painting of Clayton Kershaw's wind up. Click here for a closer look. 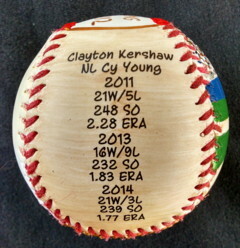 Side four has some stats from Kershaw's three Cy Young seasons. 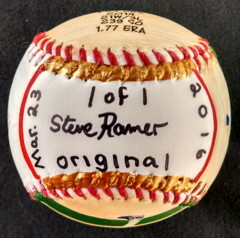 Side five, which is the top of the baseball, has my hand painted "CY YOUNG 2011,2013,2014".